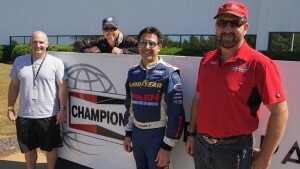 The Goulian team is one of many air show performers have the honor to be sponsored by Champion Aerospace. Champion manufacturers the finest aviation ignition products for turbine and piston engines: spark plugs, filters, magnetos, igniters, etc., established in 1900. Every few years Champion organizes its own air show just outside it’s manufacturing facility in Liberty, South Carolina for the enjoyment of its employees, employee families, and friends. It’s also a way for the air show community to give back to the very people that keep us safe in the air. “We bet our lives on Champion Aerospace products every time we take to the air. The Champion Aerospace name stands for tradition, quality, excellence; everything that we as aerobatic pilots stands for, that is what Champion is all about”, says Michael Goulian. Michael, along with the Aeroshell Team, Rob Holland, Greg Koontz, Paul Wood, Scott Yoak, and Matt Younkin, performed in the 2016 Champion Aerospace Employee and Customer Appreciation Air show in October.